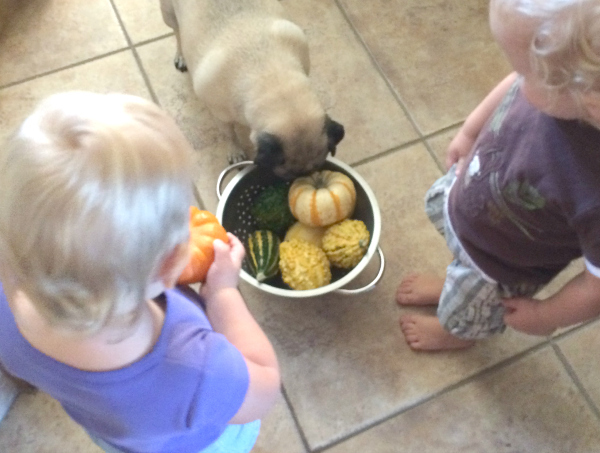 Every Fall I like to gather some gourds and mini pumpkins for my kids to explore. They love the sensory aspect of scientific discovery. 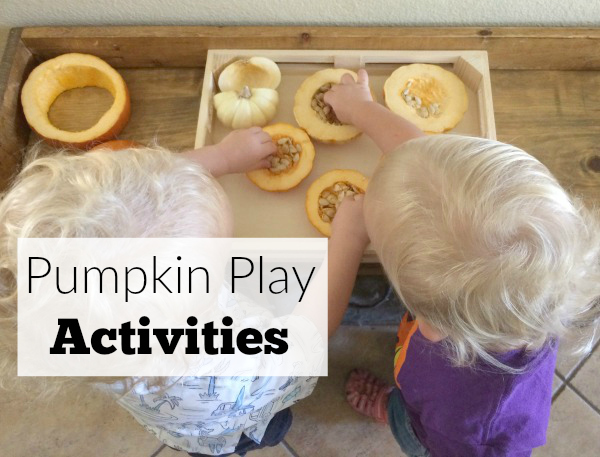 There is so much you can do for toddler pumpkin play activities. Plus, the good news is this is an inexpensive way to play in the Fall. Grab some mini pumpkins, gourds, or even the plastic craft pumpkins from your local craft store. We had a variety of all of these for some Fall Toddler and Preschool pumpkin play. I set the pumpkins and gourds on a low step so my toddlers and preschooler could see and touch the pumpkins. Nothing complicated about this! 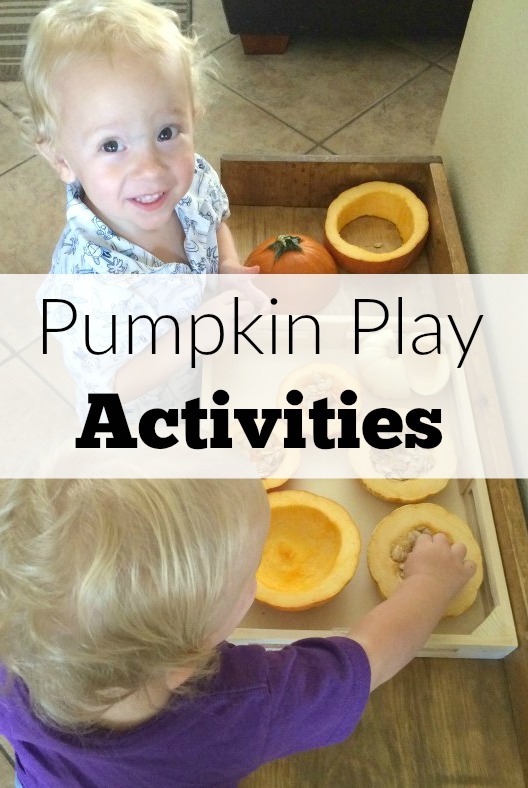 There are pumpkin activities for toddlers and pumpkin activities for preschool. The toddlers held them, tried to taste them and rolled them around on the floor. The pumpkins were stacked and stuffed into a colander too! We counted how many gourds fit into the colander. 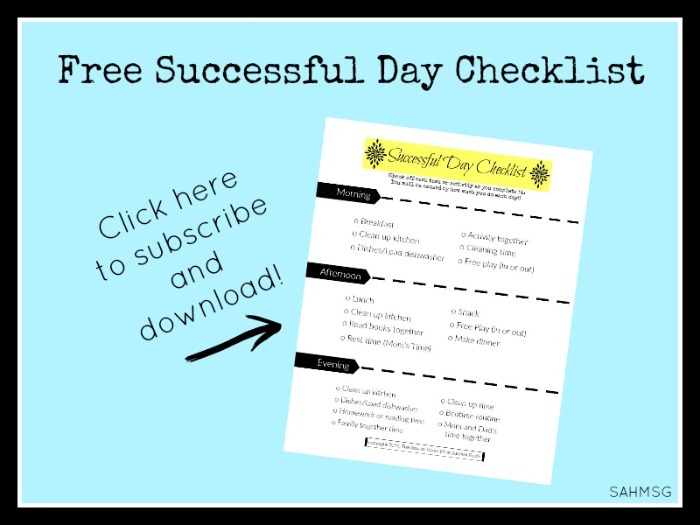 These pumpkin activities are so open-ended they cover each of the learning domains. I cut one of the larger (and easier to cut) pumpkins in half. 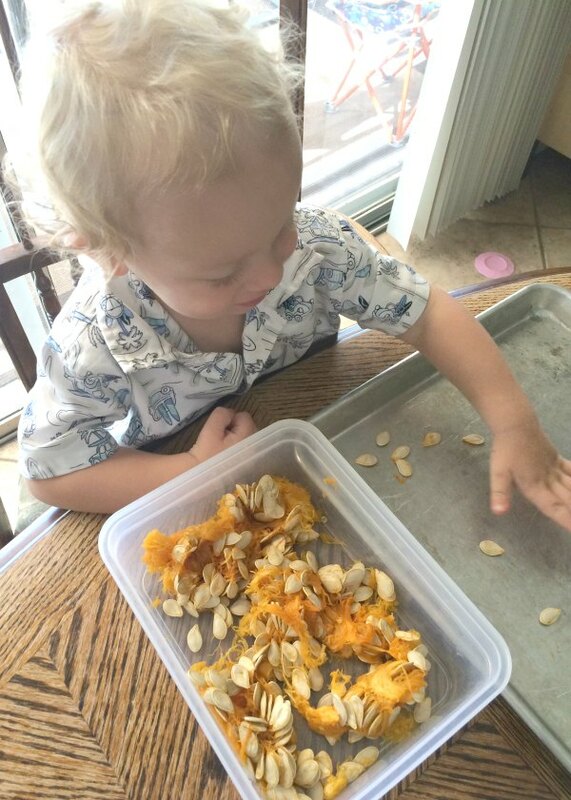 To keep the mess a bit contained, but allow my kids some hands on messy sensory fun, I scooped some pumpkin guts into a container. It’s a fun toddler pumpkin activity to feel the mushy insides and seeds. 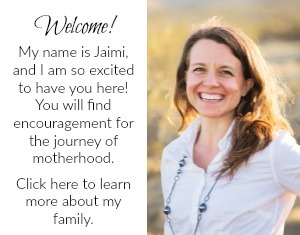 Stay near your child so they don’t spread seeds all over your house, or get them in their mouth. Although they are not toxic, they could be a choking hazard, so just stay close. 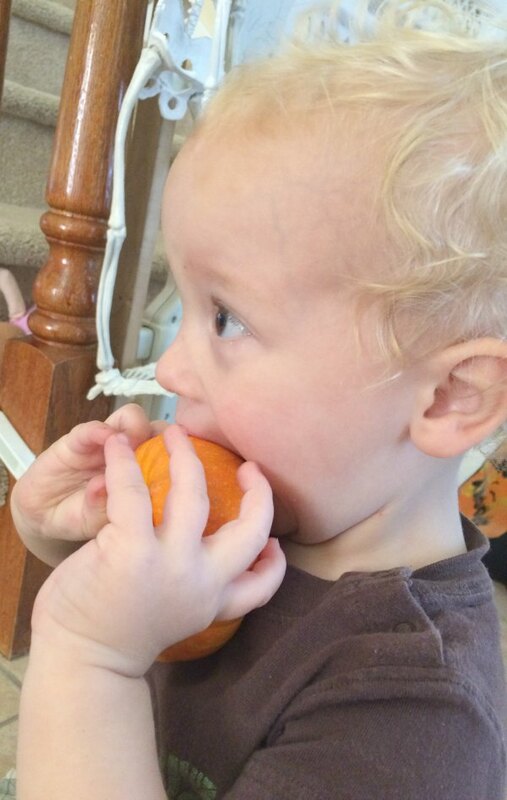 We have never had an issue with the kids handling the pumpkin insides. 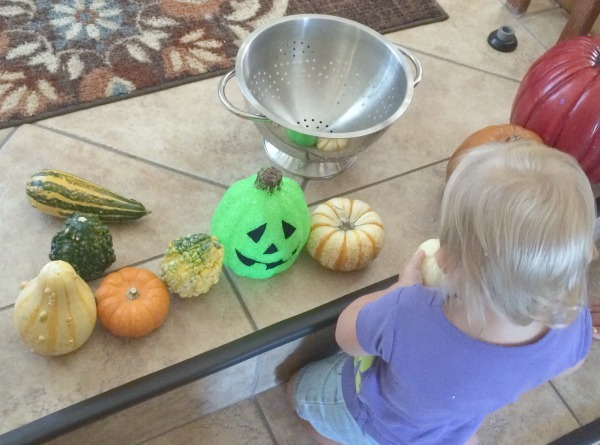 This pumpkin play science exploration is great for multiple ages too. I started counting seeds as the kids pulled them out of the pumpkin guts. 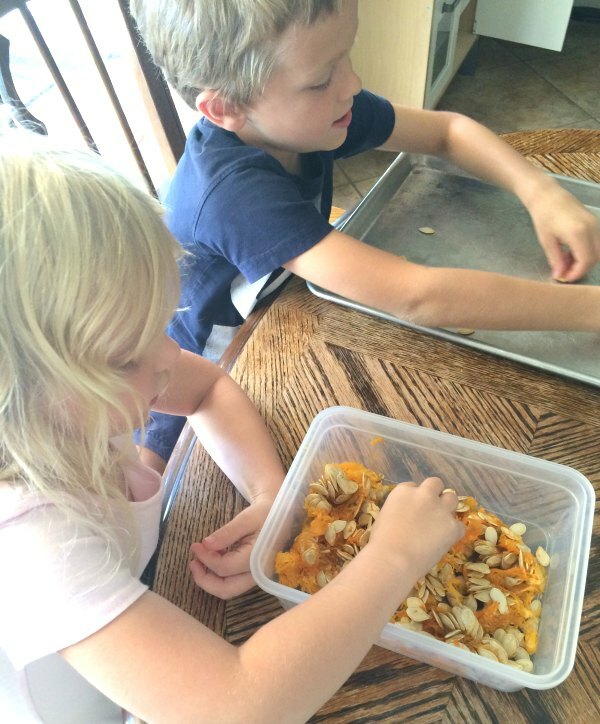 We set them aside for a preschool pumpkin seed counting activity for a homeschool preschool activity. My oldest helped us get enough pumpkin seeds out. His younger siblings didn’t quite have the attention span to stick with digging through pumpkin guts for very long. He set them on a cookie sheet so they could dry before we used them for some Fall math fun. Did you see the pumpkin puzzles activity we made with the little pumpkins? It was a fun Fall-themed puzzle and sensory experience all rolled into one. My preschooler has a preschool journal, so I asked her to get it out and draw how she explored the pumpkins. 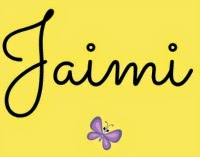 Journaling in preschool is a great way to expand on learning and reinforce pre-writing skills. The toddlers wanted to do some “writing” (coloring) too. So I made the easiest pumpkin activity ever. They had fun coloring along with big sister. Simple Fall sensory activities are so easy to create with every day items you have at home-or find out in the backyard. 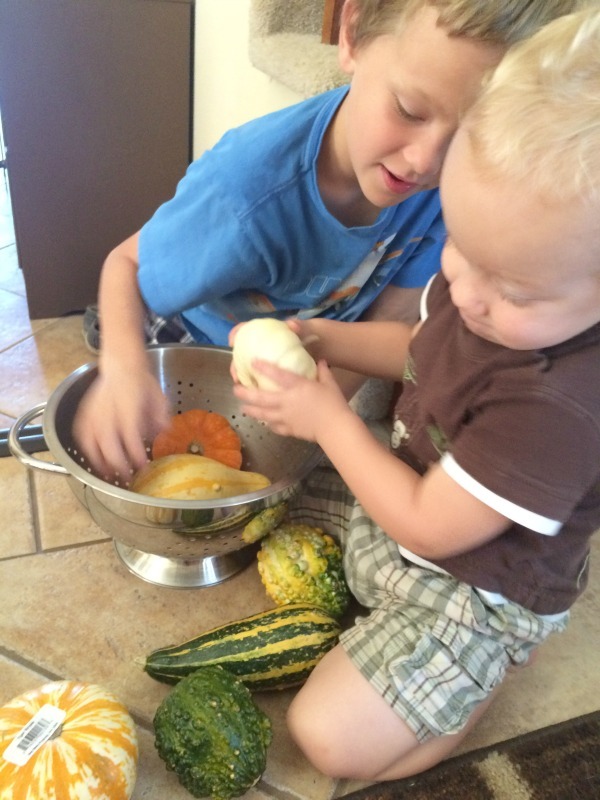 What is your favorite Fall pumpkin activity to do with the kids?